Part of me managing my health and living a fulfilled life for me is enjoyable hobbies or pastimes. One of those for me is reading. If you remember back to my goals for 2018, I had a reading goal of 15 books. Growing up, I was an avid reader, and that goal would be laughably low. Now as an adult, married with two children, finding time to read is not effortless. On the contrary, I have had to work hard to make reading a habit again. Would you like encouragement for finding time to read? Read on! Getting up early was once a habit I struggled with, and now is my favorite, most cherished time of the day. My regular morning routine for Monday through Sunday has time to read the Bible worked in but not extra reading time. So the early morning reading time comes on Sunday because the routine is different. I do not work-out on Sundays, so I use this “extra” 30 minutes in my day to do pleasure reading. This is my favorite way to squeeze in extra reading. Once I’ve popped my dinner in the oven (and set a timer! Don’t forget this! You will become engrossed in your book! ), I open my reading app or book and read as long as I’m able. Depending on the dinner (and my children’s behavior! ), I can get 30-45 minutes of reading completed! This time is best maximized if my book is on my phone. I regularly have my phone out for the recipe I am baking, so it is quickest (and least likely for me to get distracted by going to find my book!) for me to switch to my reading app and begin reading while standing right by the stove. Maybe this is odd, but I’m usually standing in the kitchen reading this entire time. If I had a bar stool nearby, I might sit, but usually I’m just reading standing up at the stove so I can keep an eye on dinner. I heard this idea recommended at a parenting talk, and I love the idea. Full disclosure: I haven’t worked this one into our routine yet, but I plan to! Sit on the couch with your kids and each of you has your own book to read. Mommy is not reading to the kids, rather everyone has their own book to read or pretend read. This might not be a large chunk of time at the beginning, but what a way to teach your kids to read and love reading! Anyone else need Sanity Saturdays or is it just me? My husband sends me take off to a coffee shop on Saturday mornings when I need a break from the kiddos. These chunks of time are much longer, 4 hours or so! So I usually finish an entire book or at least put a really good dent in one. While I’d love regular time with hours and hours to read, that just isn’t feaisble in my life right now. I imagine it isn’t possible in yours either, but if you can schedule one larger chunk of time per month, your reading list will disappear so much faster! When my husband has evening commitments, I take full advantage of the time after the kids go to bed until I go to bed to get as much reading done as possible. My end-of-day reading is usually when I like to make it picture perfect. I brew a cup of tea, turn on the fireplace, grab a blanket, and snuggle in to enjoy my reading time. Any other time of the day I am snatching minutes here and there to read, but this one, I aim to make as enjoyable as possible. My last recommendation is to plan time to read. Even if you are only going to get 10 minutes (or 5!) put it on your schedule for the day and get it done! You will be surprised how quickly that time adds up. Books will be finished before you know it! 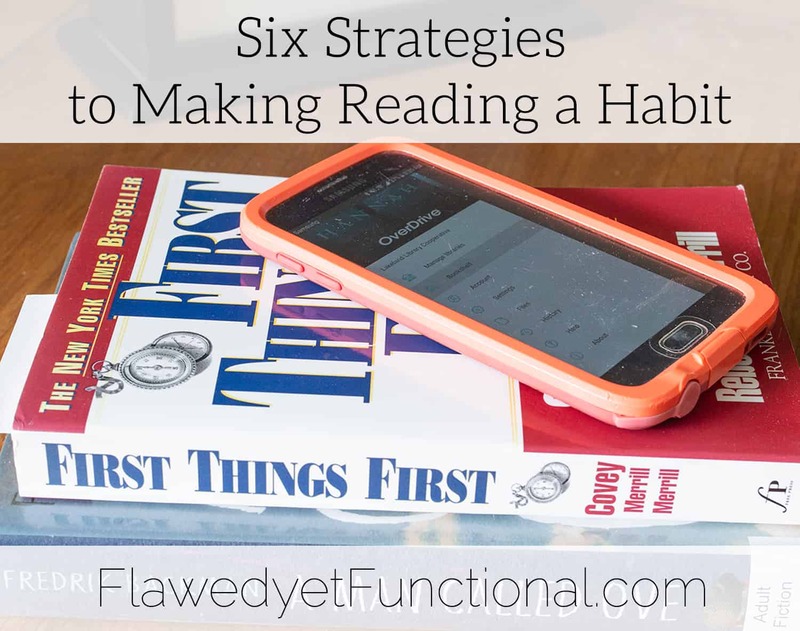 Try these six strategies to make reading a habit in your life then come back and share how it’s working! What is your favorite time to read? Do you make it an all morning/afternoon/evening event? Or are you stealing precious minutes of time to dive into your book?